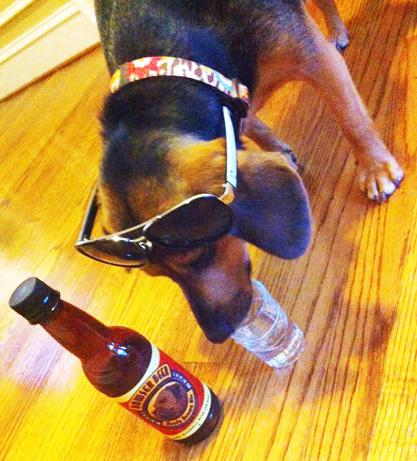 Bowser Beer is a beverage developed specifically for dogs that is non-alcoholic and non-carbonated. Homebrewing today? 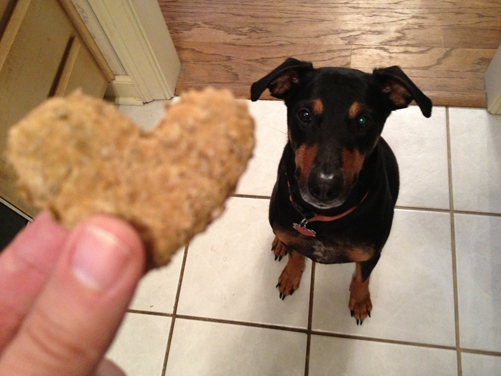 Why not make some Spent Grain Dog Treats for your pup? This recipe makes about two-and-a-half dozen medium-sized biscuits. Start with two cups of spent grain. Be sure to make these treats on brew day or refrigerate the grains and make them in a few days before they get moldy. Combine all your ingredients in a bowl and mix well. Take a rolling pin and create a dense layer on your counter. Cut out your shapes with a cookie cutter or knife. With Valentine’s Day coming up, we created hearts. Bake the biscuits at 350 F for 30 minutes to solidify them. Then, turn the heat down to 225 F and bake for additional 3 hours to dry them out and prevent mold growth. Once they cool, be sure to store them in an airtight container. Or how about dressing your pup in a beer shirt for the occasion? Any way you celebrate is perfect. Give your pup a smooch from us here at Inky Beer!